Arte e Vino, Verona, Palazzo della Gran Guardia, 11 April – 16 August 2015 ; exhibition catalogue ed. by A. Scarpa and N. Spinosa, p. 304, no. 107, illus. p. 190. This Still Life, displayed in the exhibition Arte e Vino in Verona in 2015, is a replica with variants, but with the same composition and style, of some well-known canvases displaying ‘natura in posa’ against a landscape background – grapes, vegetables and various items of fruit – by the Neapolitan painter Giovan Battista Ruoppolo. Among these, in particular, one may cite the signed canvas in a private collection (Damian, in Paris 2007, pp. 114-115; Spinosa 2011, p. 292, no. 341), similar in subject-matter but with a different layout and an accentuation of dramatic effect; a canvas in a Neapolitan collection (Middione, in Naples 1984-1985, I, p. 437, no. 2.224); and the ‘nature in posa’ pictures with identical compositions of fruits and vegetables published by Raffaello Causa in 1972. Another notable work is a coastal landscape with a citron and a display of different fruit, commissioned by Pedro Antonio de Aragón, second son of the fifth Duke of Segorbe and Viceroy of Naples from 1666 to 1671, as documented by his family coat of arms painted on one of two majolica vases containing vine shoots, in the background; the picture is now in a private collection in Spain (Pagano in Naples 2009-2010, I, pp. 412-413, no. 1.241). It is hardly coincidental that Giovan Battista Ruoppolo belonged – like his probable brother or cousin Giuseppe, also the author of ‘nature in posa’ with prevalent depictions of fruits and vegetables – to a well-known family of Neapolitan makers of majolica, and was married to Teresa Congiusto, who was a member of a family active in Naples as specialized artisans of decorated and glazed pottery. The artist was trained according to the local traditions of the early seventeenth century, which had seen the still life genre (‘natura morta’ or ‘natura in posa’) assert itself through celebrated naturalist painters and followers of Caravaggio. These include Giacomo Recco, although he was initially tied to late Mannerist approaches; Giovan Battista Recco, strongly influenced by the naturalistic paintings of Jusepe de Ribera; and Luca Forte, the principal exponent of this genre, who was long active in the workshop of Aniello Falcone. After about 1650, the tradition evolved, first with Giuseppe Recco, towards an approach initially marked by a delicate, refined use of light and colour, and gradually developed into increasingly sumptuous and even highly theatrical compositions. Giovan Battista Ruoppolo belongs to this second phase of Neapolitan ‘natura in posa’, and from the 1670s onwards he was vividly inspired by similar Roman works by Michelangelo Pace (also known as Michelangelo del Campidoglio) and the Flemish painter Abraham Brueghel, who moved from Rome to Naples in about 1680. Yet in the years after 1680 – in his detailed description of individual natural elements, rooted as he was in past naturalist tradition – Ruoppolo never turned away from the careful representation of true, concrete and tangible matter, achieved above all by a skilful play of light and shadow, and marked by pigment applied in compact, rich brushstrokes. Thanks to his penchant for expansive Baroque compositions of assorted fruits and vegetables, Giovan Battista Ruoppolo was also among the Neapolitan painters specialised in this genre who often collaborated with Luca Giordano, both when it came to including figures in compositions with fish, shellfish, flowers, vegetables and varieties of fruit, and during the preparation of spectacular exhibits of ‘natura in posa’ organised for the feast of Corpus Domini, under the patronage of the Viceroy. A case in point is Ruoppolo’s canvas of a monumental Vine shoots with bunches of grapes and an assortment of flowers and fruit, probably alluding to autumn, in which Giordano inserted the figure – almost hidden by the vines – of a young boy, as he had done on earlier occasions in canvases by Giuseppe Recco. 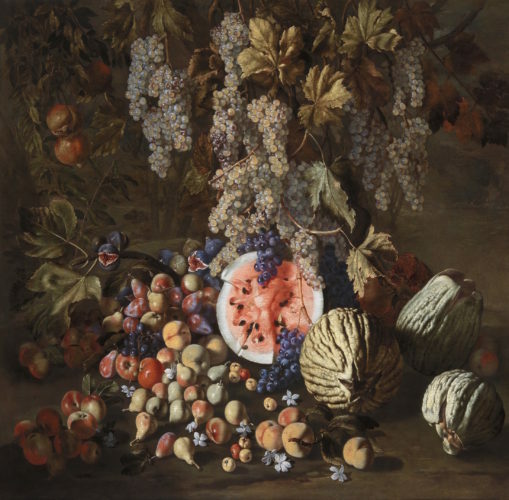 Our painting, which felicitously combines a concrete, almost tangible description of bunches of grapes and other fruit, depicted with a clearly naturalist approach, has a lavish mise en scène of individual elements that embodies a spectacularly Baroque sensibility. It can be dated to the late 1670s, when Ruoppolo was at the peak of his powers, as is also revealed here by the excellent condition of the painting. R. Causa, La natura morta a Napoli nel Sei e Settecento, in Storia di Napoli, V, Cava de’ Tirreni and Naples 1972. R. Middione, in Civiltà del Seicento a Napoli, exhibition catalogue, I, Naples 1984-1985.
exhibition catalogue ed. by N. Spinosa, Naples 2009-2010. N. Spinosa, Pittura del Seicento a Napoli. Da Mattia Preti a Luca Giordano. Natura in posa, Naples 2011.